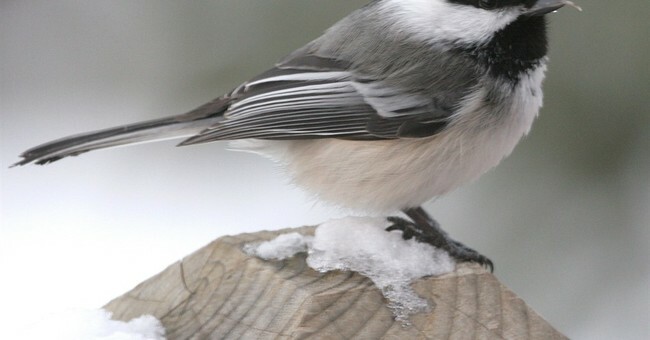 The perky little Chickadee with a black cap and deformed beak that I’d been trying to keep alive died a few days ago, the same day the 7.9 magnitude earthquake jolted me and fellow Alaskans out of bed. It mattered not that I’d been doing everything possible to accommodate the cute little guy’s needs by pulverizing nuts and seeds to make it easier for him to swoop up and swallow food with his crossed-sickle beak. Even without deformities, it’s tough for these birds, indigenous to Alaska, to survive the long and cold winters with daylight in short supply and 18-hour nights. They must eat constantly during daylight hours to regain the 10 percent body weight they burn each night staying warm. The poor little guy died as a result of chain migration when a couple of opportunistic migratory birds called Redpolls visited our feeders and came back with their extended family. Hundreds of them. Unlike Chickadees, Redpolls refuse to assimilate. Rather than sharing feeders by politely grabbing seeds and eating them elsewhere, Redpolls swarm, attack and overtake feeders, gorging themselves until the food is gone. And the next day the cycle repeats itself. It is impossible for them to coexist. The more feeding stations I set up, the more they gorge, taking from the birds that belong here and draining my birdseed budget. These incorrigible birds have no interest in assimilating and contribute nothing to the rest. I have absolutely no control, though, because they have wings, and the skies they navigate, no borders. Besides being toxic and divisive, Pelosi’s statement is downright ignorant. While I personally disagree with Trump’s proposition to offer a pathway to citizenship for those here illegally, his proposal has nothing to do with skin color. Discontinuing the ridiculous Visa Lottery Program, which invites people from countries all over the world, including those with known terrorist problems, is a no-brainer. Likewise, building a border wall and ending the preposterous chain migration program is necessary for our country’s survival. According to Conservative Review’s Daniel Horowitz, “Overall, 97 percent of the four million individuals on the visa waiting list are chain migrants whose sole claim to an immigrant visa is family ties.” He reports in December 2017 alone, a beneficiary of chain migration targeted Harrisburg, Pennsylvania police in a series of shootings. On the same day as that terrorist attack, another chain migration recipient was sentenced in a Harrisburg federal court for material support to ISIS while a female Pakistani here on an F43 visa was charged with laundering Bitcoin to raise money for ISIS. Unless Immigration is fixed it will only get worse. Case in point: Europe’s migration crisis, an ill-advised goodwill gesture that invited a sudden eruption of non-assimilating refugees that essentially upended the lives of citizens, drained resources and generally wreaked havoc on the local population. Americans are generous, but like me, they have their limits. If Redpolls had the desire to get along with all the other birds, there’s little I would not sacrifice to accommodate them. Lord knows I’ve tried. Similarly, our country has always welcomed legal immigrants to share in our national wealth and opportunity. But, it requires a willingness on everyone’s part to live up to our nation’s motto, “E Pluribus Unum,” out of many, one.